At Budget Blinds of Mill Creek, Woodinville & Mukilteo, we're your local neighborhood experts that truly understand your needs. We're in your neighborhood, we know the local Mill Creek, Woodinville & Mukilteo weather and community, and we’re backed by the #1 provider of blinds, shades, and drapes in North America. Over 25 years of customer satisfaction gives you peace of mind that only comes with choosing the proven leader. We bring the showroom to you in Mill Creek, Woodinville & Mukilteo. We expertly measure your space, install beautiful window treatments, and back it up with the best warranty in the business so you can sit back and relax in the beautiful, Mill Creek, Woodinville & Mukilteo weather and sunshine. We serve to give you the best in window treatments, so you can rest easy knowing your space will be beautified and optimized with window treatments that fit your individual needs. 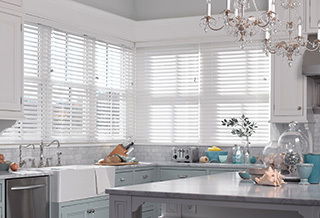 If you’ve been thinking about transforming your home’s interior into something truly special, Budget Blinds of Mill Creek, Woodinville & Mukilteo is here to help. Our expert design team, paired with an array of stunning blinds, shades, shutters, drapery, and more creates the ideal home interior that complements any room, or an entire home. From the latest styles and innovative fabrics, to a host of on-trend colors, we’ll show you how fun and affordable it can be to upgrade your décor with the power of the #1 provider of custom window coverings in North America. Our consultative process is designed around caring about you and your home. We make the entire experience easy and convenient as we bring the showroom to you with our FREE in-home design consultation. From those unique shaped windows to energy efficient treatments, and more, Budget Blinds does it all for you, with style and service for any budget! We're local and here to stay to ensure you have peace of mind. Overall good experience. We needed blinds in several rooms to match existing blinds in other parts of the house. I had no clue. BB came by, knew exactly what I needed, gave a competitive quote, and had them ready to go & installed in a reasonable amount of time. The whole process was painless. Thank you for good product & service. We needed to replace some solar shades and chose Budget Blinds for the job. We had already figured out what we wanted so it was a quick decision when Chase arrived with the samples. He gave us good advice, measured very carefully and went over everything very thoroughly as to location of the controls and how we wanted them mounted. The blinds arrived exactly within the time frame described! The installer Toshia was incredible - quick, accurate and thorough. The blinds fit perfectly into the existing mounting brackets (we were replacing old shades). It was wonderful! All in all it was a total win-win situation and I won't hesitate to use or recommend Budget Blinds of Everett again! I'm really happy with the service I got from Budget Blinds from the beginning to the end, the service is very professional and great quality in everything I got..Super happy super happy my house looks so beautiful... Thanks so much Budget Blinds you guys are the best. 30% Off our best selling blinds & shades! Offer expires 3/31/2019. Not applicable on Lutron, Hunter Douglas, or shutter products. * Applies to selected window treatments from Budget Blinds. Restrictions may apply, ask for details. Valid for a limited time, not valid with any other offers, discounts, or coupons. Offer good at initial time of estimate only. At participating franchises only.